The Sofia Lyme Fluorescent Immunoassay (FIA) uses advanced immunofluorescence-based lateral-flow technology to provide rapid differential detection of human IgM and IgG antibodies to Borrelia burgdorferi from serum and plasma specimens from patients suspected of B. burgdorferi infection. 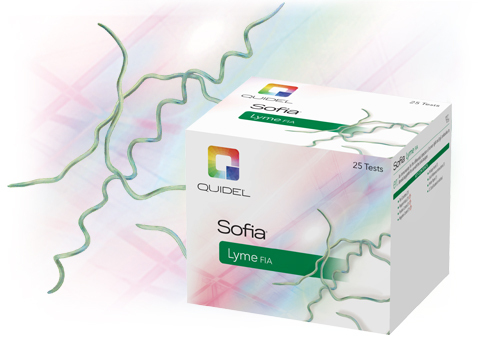 Sofia Lyme FIA with the Sofia 2 or Sofia analyzer provide automated and objective results in 10 minutes allowing Lyme testing to be performed in near-patient testing environments. Fast time to results for truly rapid Lyme testing. Clean, easy to use and dispose of. Adjusts to your volume fluctuations. IgM and IgG results with a single test.